Decoration Full-page miniatures of plants in colours, usually predominantly in green and brown, with captions and often with animals or people, on each folio. Binding Post-1600. Green leather with blind tooling in form of flowers and fleur-de-lys. Provenance Nicholas Joseph Foucault (b. 1643, d. 1721), marquis de Magny, statesman and archaeologist: his book-plate with the legend 'EX BIBLIOTHECA | NICOLAI JOSEPH FOUCAULT | COMITIS CONSISTORIANI' with his arms [sable] a lion rampant, dexter, crowned [argent], as supporters two lions [argent]; a couronne de marquis surmounting the shield (f. 1). Sir Hans Sloane (b. 1660, d. 1753), baronet, physician and collector: inscription 'Bibliotheca Sloaniana' (f. 1). Former shelfmark (?) '5Vh' , and crossed out (ff. 1, 1v). This manuscript is classified by Baumann as one of the 'North Italian group' and as a copy of Paris, Bibliothèque de l'Ecole des Beaux-Arts, MS Masson 116; see also Collins 2000 pp. 279, 226 n. 71. For Foucault's library generally see Léopold Delisle, Le Cabinet des Manuscrits de la Bibliothèque Impériale [Nationale]: Étude sur la formation de ce dépôt 3 vols. (Paris: Imprimerie Nationale, 1868-1881), I, 373-380. Select bibliography Catalogue of Additional Manuscripts: Sloane 4015-4047 (London: British Museum unpublished manuscript of unedited descriptions, no date), no. 4016 [available in The British Library Manuscripts Reading Room]. Felix Andreas Baumann, Das Erbario Carrarese und die Bildtradition des Tractatus de herbis, Berner Schriften zur Kunst, 12 (Bern: Benteli, 1974), esp. pp. 105, 161-71. Janet Backhouse, The Illuminated Manuscript (Oxford: Phaidon, 1979), pl. 43. Peter Murray Jones, Medieval Medical Miniatures (London: British Library, 1984), p. 90, pl. VII. Lucia Tongiorgi Tomasi, ‘Toward the Scientific Naturalism: Aspects of Botanical and Zoological Iconography in Manuscripts and Printed Books in the Second Half of XV [sic] century’, in Die Kunst und das Studium der Natur vom 14. zum 16. Jahrhundert, ed. by Wolfram Prinz and Andreas Beyer (Cologne: Acta humaniora, 1987), pp. 91-101 (p. 98). Two East Anglian Picture Books : A Facsimile of the Helmingham Herbal and Bestiary and Bodleian Ms. Ashmole 1504, ed. by Nicholas Barker (London: The Roxburghe Club, 1988), p. 7. Michael Camille, The Medieval Art of Love: Objects and Subjects of Desire (London: Laurence King, 1998), pp. 79-80, pl. 65. Peter Murray Jones, Medieval Medicine in Illuminated Manuscripts, 2nd edn (London: British Library, 1998; first publ. as Medieval Medical Miniatures, 1984), pp. 70-73, fig. 63. 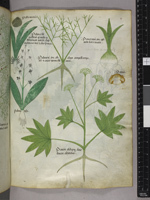 Minta Collins, Medieval Herbals: The Illustrative Traditions (London: British Library, 2000), pp. 112 n. 314, 226 n. 71, 239, 279, 294 n. 125, 295 n. 141, 296 ns 154, 155, 309, pl. XXVIII. Sophie Page, Astrology in Medieval Manuscript (London: British Library, 2002), p. 10. Pamela Porter, Courty Love in Medieval Manuscripts (London: British Library, 2003), p. 10. Sophie Page, Magic in Medieval Manuscripts (London: British Library, 2004), pp. 20, 25-27, pl. 19, 25. Elizabeth Morrison, Beasts: Factual & Fantastic (Los Angeles: J. Paul Getty Museum, 2007), p. 30.